Investiture is a ceremony in which someone becomes a member of a group. 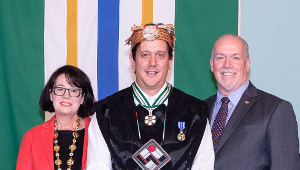 In this case, appointees or those named as members become invested into The Order of British Columbia, and are members for the rest of their lives. Members of The Order of British Columbia can use the initials ‘O.B.C.’ after their name. Referred to as post-nominals. What do the letters after person’s name mean? These letters are called post-nominals. Not all Canadian Honours entitle the awardee to use post-nominals. Who can nominate someone for The Order of British Columbia? Any person or group is welcome to nominate a deserving individual as a candidate for appointment to the Order of British Columbia. Nominations require a nominator and two letters of support. You can download a nomination form from this site or submit online. You can also contact the Honours and Awards Secretariat and request a form be sent to you. One form per nominee, please. All nominations are confidential to respect the privacy of the people consulted and to avoid disappointment of the nominees, and we ask that the nominators and others involved do the same. Nominators may be contacted to clarify information provided. 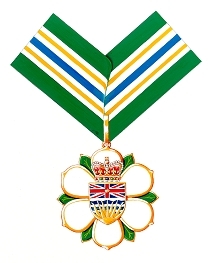 All nominations received for the Order of British Columbia are processed by the Honours and Awards Secretariat. Once your complete nomination (nomination form and two letters of support) has been processed, you will be contacted by email and given a file number for your nomination. Please ensure all material reaches the Secretariat before the deadline (first Friday in March). You will also be contacted by email following the selection process about the status of your nomination. Please refer to the website www.orderofbc.gov.bc/news for the latest updates. 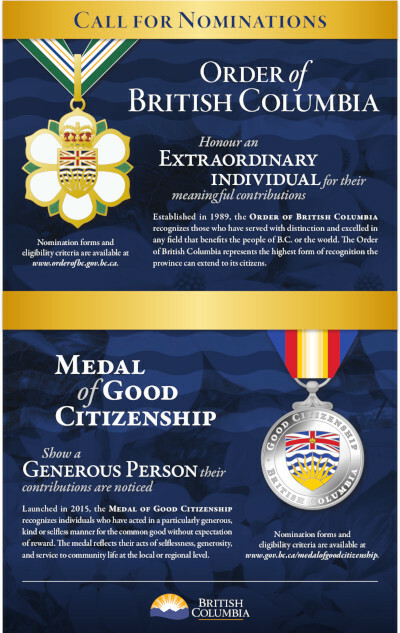 Any resident of British Columbia, or former long-term resident, who has demonstrated outstanding achievement, excellence or distinction in any field of endeavour benefiting the people of the Province or elsewhere is eligible. Your nominee must be living at the time you make the nomination and must not be a current Federal, provincial or municipal elected representative. Note that a Chief or other member of a governing body of an indigenous nation is not prohibited from appointment to the Order while in office. The Secretariat keeps all nominations confidential to respect the privacy of the people consulted and to avoid disappointment of the nominees, and we ask that the nominators and others involved do the same. When are the selections made? The Advisory Council usually meets in April each year and makes recommendations to the Lieutenant Governor-in-Council. Successful nominees and their nominators are usually notified before June by telephone. Nominators whose submissions are unsuccessful will be contacted by mail or email in late June and will have the opportunity to carry their nomination forward to next year. In the case of election years, this timeline may be delayed. 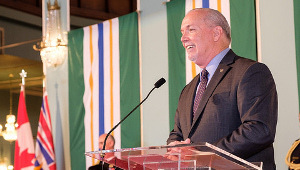 To check the status of your nomination, email bchonoursandawards@gov.bc.ca and reference your file no. We are unable to release information to persons other than the nominator. All nominations are confidential. Nominators may be contacted to clarify information provided. Nominators will be contacted by email following the selection process regarding the status of their nomination. Please refer to the website www.orderofbc.gov.bc/news for latest updates. How many people receive the Order of British Columbia? Between 13-16 people are invested into The Order each year. Whom should letters of support be addressed to? What is the Order of British Columbia Insignia? The insignia of the Order of British Columbia consists of a stylistic dogwood, the floral emblem of British Columbia. The insignia is part of a medal which also features a crowned shield of arms. It is worn with a green, gold, white and blue ribbon. The member’s name and year of investiture are engraved on the back of the medal. A lapel pin button of the Order can be worn anytime with street clothes. Each recipient of the Order also receives a Certificate of Appointment signed by the Lieutenant Governor and be granted the right to have the letters O.B.C. placed after their name. When and how can the insignia be worn? * Print version – Adobe Acrobat format. To read Adobe Acrobat® files, you will need to download and install the free Acrobat Reader® software available from Adobe Systems Incorporated. Where can I have my medals mounted? I have lost or broken my lapel pin. Can this be replaced? Miniatures and lapel pins of the Order of British Columbia are available for purchase by Members of the order only. Members should complete the Order Form and submit directly to Rideau Recognition Solutions Inc. at LisaDesjardine@Rideau.com. If you lose your insignia, please contact the Honours and Awards Secretariat. I have more than one medal. What is the protocol for wearing them? The Canadian Honours System has rules regarding the Order of Precedence of its various honours. Please visit the Governor General of Canada website at http://www.gg.ca/document.aspx?id=14979 for more information for the sequence for wearing the insignia or Canadian orders, decorations and medals. The Canadian Honours System has rules in regards to the Order of Precedence of its various honours. 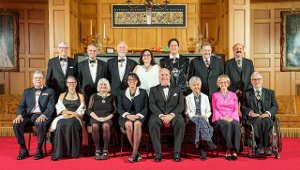 The following (http://www.gg.ca/document.aspx?id=14979&lan=eng) are the Canadian Honours System post-nominals and Order of Precedence as of April 2, 1998’s Privy Council no P.C. 1998-591. The asterisk (*) indicates approved honours added since that date. Honours provide official recognition of citizens by the people through their head of state – in Canada’s case, the Queen. Honours, by international custom, entitle the recipients to wear the “insignia” (usually medals on a ribbon) around the neck in some cases, on the left side of the jacket, dress or uniform in most others. Some honours entitle the recipients to post-nominal letters (initials after their names). Awards are a form of recognition which can be given by any organization, including governments, and may take the form of certificates, plaques, trophies, lapel pins and sometimes medals – although these should not be worn in the same place as the insignia of honours recognized by the Canadian Honours System. What if my nominee is not eligible? For a full list of alternate awards and recognition programs please access the link under Other Awards and Recognitions.